- Disclaimer: This newsletter is not produced by GSGSSI; it does not necessarily reflect their views. As part of an initiative to ensure all licensed fishing vessels are of a good standard, GSGSSI are undertaking inspections of all vessels to check their compliance with the Torremolinos Protocol on Fishing Vessel Safety. The Torremolinos International Convention for the Safety of Fishing Vessels was adopted in 1977 but, for technical reasons, never came into force. It was superseded by the 1993 Torremolinos Protocol and more recently, by the Cape Town Agreement of 2012 on the Implementation of the Provisions of the 1993 Protocol relating to the Torremolinos International Convention for the Safety of Fishing Vessels, 1977. All UK flagged vessels are inspected for compliance with the Torremolinos Protocol as part of their standard Maritime and Coastguard Agency (MCA) safety inspection. For non-UK vessels GSGSSI have called upon the services of specialist consultant Cedric Loughran, who is the former head of Fishing Vessel Safety at the UK MCA, to undertake the inspections. The inspections focus on the safety of the vessel, vessel maintenance and the suitability of the living and working quarters. A typical inspection involves a thorough check of the ship’s papers, a full tour of the vessel to look for any safety issues and the witnessing of a safety drill. This season all the toothfish longliners were inspected either before the season started or during mid-season off-load. All six vessels passed the inspections and Mr Loughran was impressed with standard on all the vessels. All four icefish vessels were also of a high standard and passed their inspections with no deficiencies. Arranging inspections for the krill trawlers has proved more challenging, as the vessels apply for licences at short notice. So far four krill vessels have been inspected. Of these two passed without any issues. A further vessel was required to address minor issues in the engine room and crew’s washrooms, whilst one vessel failed the inspection. Two other vessels are due for inspection in October. For the 2014 season all vessels must have been inspected prior to receiving a licence to fish in the SGSSI Maritime Zone. Once a vessel has passed muster, she will not need to be inspected again for 2 years. The report reviews the key Government activities in the Territory, notably fisheries and tourism management and environmemtal and cultural heritage projects. The fisheries for toothfish in the SGSSI Maritime Zone account for over 70% of GSGSSI revenue. However the high value of toothfish also means that it is essential they have a dedicated patrol vessel, the costs of which use 80% of the toothfish revenue. Management of the toothfish fishery continues to improve, for instance with the introduction of marked hooks, prohibition of net bags and establishment of Benthic Closed Areas. With the current MSC certification of the fishery due to expire in 2014, the assessment process for recertification will start soon. Over 50,000 tonnes of krill was caught in the krill fishery in both 2011 and 2012. The icefish fishery remains highly variable, with exceptionally big catches in early 2013. The icefish fishery was recently MSC certified in an industry led initiative and GSGSSI will work with the industry to maintain the certification. A Marine Protected Area (MPA) was established in the Maritime Zone in 2012 and a revised ‘Marine Protected Area Order’ was made in June 2013. The report states that the Establishment of the MPAs clearly demonstrates that even in an environment as rich and diverse as South Georgia and the South Sandwich Islands, it is possible to have sustainable fisheries with minimum impact on the marine environment. GSGSSI will monitor activities throughout the MPA and will undertake a formal review every 5 years and, where appropriate, will address issues between formal reviews. GSGSSI has benefited from funds jointly contributed by the Norwegian and British governments to mark the centenary of Amundsen and Scott’s journeys to the South Pole. GSGSSI has used the money to undertake heritage projects including: laser surveys of the whaling stations; partial restoration of the Nybrakke at Grytviken; and stabilisation of the old Manager’s Villa at Stromness. The impressive results from the laser survey work will be built on with further survey work at Leith whaling station in 2013. Work is also planned to stabilise the historic original Manager’s Villa at Stromness in the year ahead. Work to renovate Discovery House at KEP will be completed in the next few months, and the building will be officially opened in December, with the first visiting scientists due to use the new facility in February 2014. The report highlights the recent GSGSSI environmental initiatives including the reindeer eradication work, monitoring of non-target mortality following the South Georgia Heritage Trust’s work baiting to eradicate rats and non-native plant management. An overview of last season’s tourism and expedition activity is given, and the report states that following an inquest into the death of a cruise ship passenger whilst on a the ‘Shackleton Walk.’ GSGSSI will “implement new procedures and documentation for Visitor Permit Holders” and will undertake a review of all guided walks and of the provision of medical support of cruise ships that visit South Georgia. An overview of Government finance is given towards the end of the Annual Report. It states that in recent years GSGSSI resources were “severely stretched” due to reductions in fishery incomes, reduced tourism and increased fuel costs. A deficit of £674,000 in 2010 was, however, reduced to £125,000 in 2011 and preliminary figures for 2012 suggest a deficit of £79,000. Savings have been made by reducing travel costs, finding cheaper fuel suppliers, and allowing the sub-chartering of the fishery patrol vessel Pharos SG for short periods of work in Falkland Islands waters. The Government expects to show a small surplus in 2013, and in the long-term aims to maintain at least one year’s operational costs in reserve. The first GSGSSI Annual Report ends with an overview of the roles of the nine GSGSSI personnel. GSGSSI would welcome feedback on the content and structure of the new report. 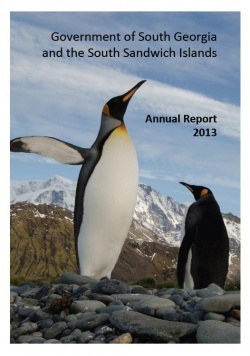 The GSGSSI 2013 Annual Report can be downloaded here. The krill fishing season tailed off during September. One trawler finished fishing on the 2nd, another on the 3rd, leaving two vessels fishing for krill and obtaining moderate catches. One of the remaining vessels then suffered engine problems and departed the fishery to sail to Punta Arenas, Chile, for repairs. The last trawler continued fishing with moderate success until leaving the fishery on September 24th. A reefer anchored in Cumberland Bay on the 13th to receive krill from a trawler, but transhipping operations were postponed due to bad weather. Two trawlers are expected to arrive to be licensed to fish for icefish in early October, and one trawler to fish for krill. The German research vessel Polarstern has been conducting research in the area throughout the month (see below). 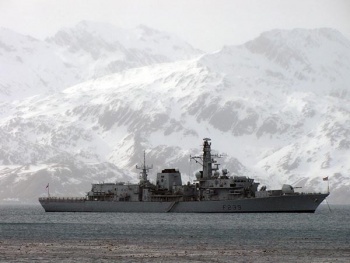 HMS Richmond was on patrol in the SGMZ towards the end of the month (see below). HMS Richmond was on patrol in the SGMZ at the end of September and came to anchor off Hope Point on the 27th for a three-day visit. HMS Richmond is currently on a 7-month Atlantic patrol providing on-going protection and reassurance to British interests within the region. A small party came ashore that night for a dinner hosted by the GSGSSI Government Officers. The Type 23 frigate had 185 personnel on board, most of whom were able to get ashore over the next two days for leg stretches. The Naval Chaplin (known by naval tradition as ‘The Bish’) held a service in the Grytviken church on both mornings. Many of the sailors enjoyed a spot of sledging, and most were fortunate to see a penguin or two on the beach. KEP personnel were glad to accompany groups on a longer walk to Penguin River on both days, though those ashore on the Sunday were blessed with very much better weather than the snow and wind experienced the day before. A Mountain Leader working at the military outdoor adventure facility at Stanley, Falklands, was aboard HMS Richmond as a guest, and led a small adventurous group which included the ship’s captain, Commander Robert Pedre, up Brown Mountain to enjoy magnificent views from the top. The Post Office was taken on board the vessel on both main days of her visit and was very busy. One of the KEP harbour launches was used to assist moving the ship’s crew to and from shore. The Museum at Grytviken was open throughout the visit and was the venue for coffee and cake after both church services. KEP locals were invited aboard for a great fun night of ’Penguin Racing’ in the ship’s hangar, and a good deal of money was raised by the ship for charity. 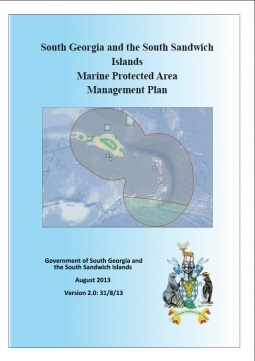 GSGSSI has issued an updated Management Plan for the Marine Protected Area (MPA). ‘Version 2’ of the Management Plan was published on August 31st. A revised Marine Protected Area Order came into force on June 13th 2013. The additional protection includes a ban on bottom fishing deeper than 2,250 m, additional benthic closed areas in the depths fished for toothfish, a seasonal closure (November 1st to March 31st) of the Antarctic krill fishery, and a 12nm pelagic closed area around the South Sandwich Islands. The updated management plan provides details of the MPA, the rationale behind each area of the MPA measures, and details of surveillance and monitoring that will be established. The MPA is currently monitored by a series of scientific programmes undertaken by GSGSSI and the British Antarctic Survey (BAS). The Maritime Zone is patrolled by a dedicated fishery patrol vessel. The MPA provisions will be reviewed every five years, or if new threats or significant new data emerge in the intervening period. The Management Plan gives an overview of South Georgia and the South Sandwich Islands and their marine flora and fauna; covers the history of exploitation of marine resources (whaling sealing and fishing), and describes the current fisheries for toothfish, icefish and krill, the closed fishery for crab, and the lack of prospects for any commercial squid fishery now or in the future. Also covered are: visiting vessels; marine pollution; climate change; and glacial retreat and freshwater runoff. Also outlined in the document is what surveillance there is of the fishing zones along with various monitoring programs in place such as the regular ‘Groundfish Survey’ and science work on higher predators. The final appendix is a species list for the area. The legislation ‘South Georgia and South Sandwich Islands Marine Protected Area Order 2013’ is included in the appendix along with earlier legislation. The 63 page 13.5mb pdf document can be downloaded here. A clever computer animation using laser survey data has made it possible to view the remains of Husvik Whaling Station in a way never seen before. The closest you could get to the extraordinary view would be in a low flying helicopter, but even the smallest nimblest helicopter could not give you the views you can see on this short video. The one and a half minute compilation is mainly aerial views of the station, looking down on buildings largely devastated by the natural forces of South Georgia’s weather, but the sense of a sizeable township and factory is still there. The film was made by rendering the readings of the laser survey conducted early last summer, hence you can see snowdrifts heaped against the sides of the single storey bunkhouses at the back of the station. The main processing buildings around the edge of the plan area, where once whales were dismembered and boiled down for oil and bone meal, are some of the most devastated buildings, little more than piles of tangled metal and rotten wood, but there are still factory chimneys standing tall above the devastation, and this amazing view flies you past these to suddenly focus in on the frontage of a store; so you still get a feel for the size and layout of the whaling station. Husvik whaling station has been off-limits to most people for several years due the dangers of asbestos and flying debris, so for most this is the most intimate view we will get of what remains. The 3D fly-through was created by Geometria, a New Zealand based heritage consultancy company. During the surveys laser equipment was used to map both inside and outside buildings to make a 3D model with millimetre accuracy. The work was mainly funded by the Norwegian Government, as part of the agreement between the UK and Norwegian governments to commemorate the centenary of Scott and Amundsen's journeys to the South Pole. You can see the video here. 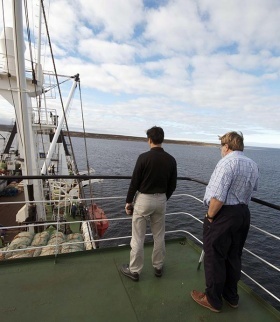 The German research vessel Polarstern has been operating in South Georgia and South Sandwich Island waters conducting scientific research. With 51 scientists and science technicians on board, the emphasis of their work is to study of the condition of Antarctic krill in the Scotia Sea during the transitional phase between winter and spring. The vessel arrived at South Georgia, to Sunset Fjord, on August 25th to calibrate instruments. Divers also operated off the ship to test equipment. The ship then sailed on a transect heading south to the sea ice, during which they were research trawling for krill. As part of the research the scientists wanted to set up a science camp on an ice island (floe), but aware of the dangers of doing so, great effort was put into choosing the right floe. The chosen floe needed to be large enough to accommodate the planned scientific activities, thick enough to withstand bad weather conditions and thus provide a safe work environment, yet had to be thin enough to allow for efficient ice core sampling and the drilling of holes through which the divers could enter the water below. The ship’s helicopters made reconnaissance flights making initial airborne measurements of the sea ice thickness of likely floes. Having picked the right floe, the ship pulled up alongside and on September 1st, in temperatures of -22°C, the first diving camp was set up and the divers were soon operating, as was an ROV (Remotely Operated Vehicle). 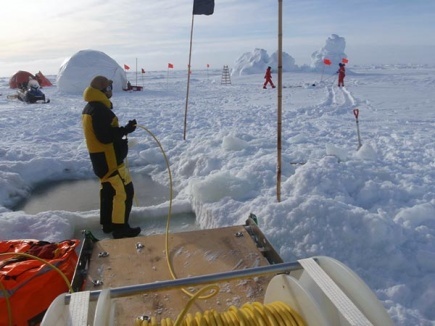 The dive team, operating from the shelter of a tent on the ice above, collected information on the behaviour and distribution of larval krill under the ice floe, and collected samples using an instrument resembling “an underwater vacuum-cleaner”. The samples were then used for various experiments and analyses in the laboratories aboard Polarstern. Much other varied science work was done from the floe over the following nine days. The vessel then steamed north, to conduct comparative studies in the ‘marginal ice zone’ on the condition of krill in this markedly different habitat, then returned south, to a new study area south-east of the South Sandwich Islands where they searched for another suitable floe on which to set up the second ice-floe camp. The search was aided by use of satellite photographs, and soon the camp was established and the dive work was underway again. The results of the expedition will help quantify the impact of a winter sea ice decline on the population of krill in the future. Krill plays a central role in the food web of the Southern Ocean, hence variability or decline in krill biomass will have a large impact of the marine Antarctic ecosystem. Expeditions in Antarctic winter like this one are rare due to the extreme sea ice and weather conditions; hence little scientific data has been available from this period of the year. The research cruise is due to end in mid-October when the vessel reaches Cape Town, South Africa. Renowned sculptor Anthony Smith will be Artist in Residence at the South Georgia Museum this summer. Anthony Smith says he is drawn to South Georgia because of his passion for natural history, an interest he developed when he grew up in the Middle East. He later studied zoology at Cambridge University, and as a student pursued his interest in sculpture in his spare time, learning the traditional nineteenth-century sculpting techniques and the process of bronze casting. He began exhibiting wildlife sculptures aged 18 and soon also developed an interest in human figure sculpture. 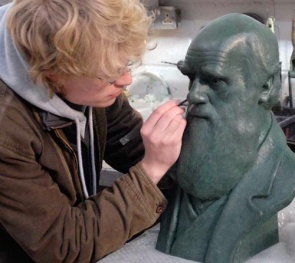 After graduating in 2005 he set up a sculpting studio in Cambridge and began working on commissioned sculptures, one of which was a life-sized bronze statue of the young Charles Darwin which was unveiled by HRH Prince Philip on the bicentenary of Darwin’s birth, and subsequently short-listed for the Marsh Award for Best Public Sculpture of the Year. Anthony Smith has already spent time in the southern Ocean area: in 2009-2010 he spent eight months as ship’s artist and photographer on board the tall ship Stad Amsterdam as it followed the course of Darwin’s famous voyage in the Beagle; the voyage was filmed for a Dutch TV company; and in 2012 he spent time as Artist in Residence in the Falkland Islands on a Shackleton Scholarship. Anthony Smith is an Associate Member of the Royal British Society of Sculptors, and a Fellow of the Linnean Society of London. Other recent high profile commissions include an appointment to the Royal Mint to design a new £2 coin. The sculptor, now based in Amsterdam (Holland), will arrive in South Georgia in late November, as soon as possible after unveiling his latest commission, a seven-foot tall bronze of Alfred Russell Wallace at the Natural History Museum (NHM) of London on November 7th; the first new statue commissioned for the NHM in more than 80 years. 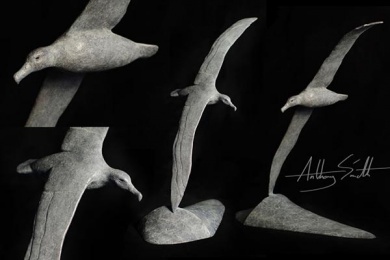 A bronze albatross sculpture by Anthony Smith will be used to raise funds for the SGHT Habitat Restoration Project. Very few women lived on South Georgia during the whaling era, those that did were usually members of the whaling station manager’s family or staff in the manager’s house, so the sick young man arriving here on October 18th 1911 probably had little thought of romance as he landed amidst the stench and hiss of the factory from the ship Deutschland. Dr Ludwig Kohl had joined the ‘2nd German Antarctic Expedition’ in Buenos Aires as one of two doctors. The expedition was commanded by Dr Wilhelm Filchner and was headed to Antarctica to map the continent. Just a few days out from port Dr Kohl realized that he was suffering from severe appendicitis that needed urgent action. Having made his will he insisted the other ships’ doctor, Dr von Goeldels, and an assistant operate despite being on the high seas. Luckily the sea was calm during the operation. The unwilling assistant was squeamish and had fortified his resolve with whiskey. Years later, when Dr Kohl met with old friends from the crew, he was told that during the operation the assistant’s glasses had fallen into the open operation wound. Despite that, the operation was successful, but shortly after the sea picked up, becoming very rough. The storm persisted and Dr Kohl had to be strapped into his bunk to prevent him falling out for the eight days it took for the ship to reach South Georgia. Unsurprisingly the Norwegian doctor at Grytviken considered the recovering man still too poorly to continue with the expedition. While he recovered and awaited passage off the island Dr Kohl became a guest at Grytviken, the whaling station founded and now managed by Cpt Carl Anton Larsen. A few weeks later, on December 6th, the manager’s daughter Margit arrived on the steamer Harpon. 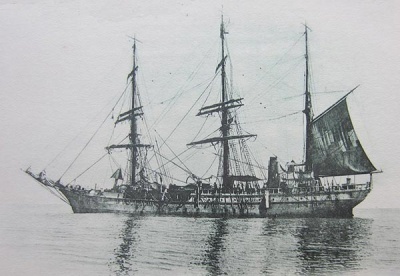 The expedition ship Deutschland stayed in the area for 48 days conducting research around the island’s shores and making a 2 week trip to the South Sandwich Islands. The expedition secured a replacement doctor from the Harpon and was ready to set sail for the Antarctic, leaving on December 11th; so on the 8th Larsen threw a farewell dinner. Both Dr Kohl and Margit attended and the attractive young daughter of the house made an immediate impression on the recovering man. Dr Kohl fell in love with her instantly. The lovers-to-be both attended the farewell dinner thrown by CA Larsen for the members of the Deutchland expedition. Dr Kohl sitting 2nd from left, Margit sitting in the middle of the picture. The magistrate, Edward Binnie, sits between the two ladies. Only a few days later it was his turn to leave, he had passage back to Buenos Aires on the Harpon Before he left he sent a token of his love to Margit, perhaps the shortest distance postcard ever sent on the island. 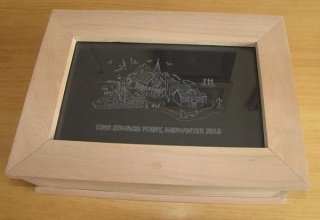 It was sent on December 16th from King Edward Point to the Grytviken Managers House just 1 kilometre away. The short message (translated) read “One last heartfelt greeting, Dr L. Kohl”. Maybe the Magistrate Edward Binnie handed the postcard to Margit on the day Dr Ludwig Kohl left? On December 20th Dr Kohl left South Georgia en route back to Hamburg, Germany. There he waited hoping to hear from Margit. Now recovered from his appendicitis he was struck instead by lovesickness, his diary reveals the depth of his feeling. In March he wrote, “Hourly longing for news from South Georgia from Margit. All my future plans depend on the receipt and contents of her letters.” Then on April 29th he wrote, “Where is Margit? All this waiting! A real punishment for a human being!” But the wait went on, and for months more he had no news. Disappointed not to have been able to go to Antarctica, the adventurous Dr Kohl began to think about a new expedition to the Arctic with Schröder-Stranz, but reconsidered when he realised the expedition was poorly prepared for the polar regions, and he was right, the expedition to Svalbard ended in disaster with half the expedition team dead. Dr Kohl filled in the time exploring Norway travelling along the coast ending up in Oslo in September 1912. While walking in the streets on a sunny autumn day he suddenly recognized a girl at a street corner looking at him: Margit! Flummoxed at first by this unexpected encounter, he then realized that Norway was Margit Larsen´s home country. From then on things developed rapidly and on November 27 they announced their engagement. Starting the career he is best known for Dr Kohl joined the Max von Oppenheim excavations on the Tell Halaf in Mesopotamia (Iraq today). When he returned he and Margit married on September 18th 1913 in Oslo and used their married name Kohl-Larsen. Afterwards they travelled and worked together on anthropology, starting with a period working on the island of Yap, Caroline Islands (a colony of the German Empire at that time). After his disappointment of not being able to continue with the Deutchland expedition, Dr Kohl did finally get to the Antarctic. In September 1923 he joined the Norwegian Ross Sea Whaling Expedition on the first ever whale factory ship the Sir James Clark Ross, commanded by his father in law C.A. Larsen. Both Dr Kohl and Margit were to return to South Georgia too, on their own Kohl-Larsen expedition in the summer of 1928/29, mainly to study the glaciers. The third member of the expedition was cameraman Albert Benitz and together they shot the film “Roah Roah”. The Kohl-Larsen Plateau, (now sadly only known as the Kohl Plateau) is the largest snowfield on South Georgia and was named for Dr Ludwig Kohl-Larsen. The great romance that started with a postcard in South Georgia in 1911 came to an end when Dr Kohl died in 1969 aged 85. Margit died in 1990 aged 99. You can read the original philatelic paper, “The Arrival of the German South Polar Expedition in South Georgia Island in 1911 and the adventurous life of Prof Dr Ludwig Kohl-Larsen” by Albert-Friedrich Gruene here [.doc]. 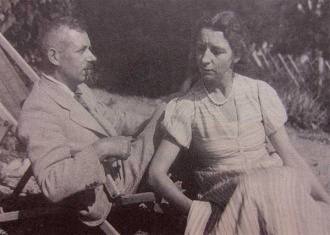 Prof Dr Ludwig Kohl-Larsen and Margit Larsen in their home near Lake Constance (Bodensee) in Germany in 1931. What Language Do Desert Penguins Speak? A researcher who has studied captive penguins in Dubai will shortly find his way from the desert to South Georgia to conduct research on a natural population. Dr Brent Stewart, an American marine scientist, had a brief period at Ski Dubai to study its population of gentoo and king penguins ahead of the planned three-week expedition to South Georgia in October. His research is to study and record penguin calls, which are unique to each bird and enable them to recognise each other even among thousands of others. He will compare the SG recordings with ones made from the penguins in Dubai. By comparing recordings between males and females and between captive and wild birds, Dr Stewart is hoping to learn more about how their calls enable breeding pairs, and parents and offspring, to identify each other. He will also study differences in the birds’ plumage and how these change with age and other factors. Dr Stewart is expecting to fly a drone over the bird colonies to help provide an accurate population count. Ski Dubai, which features an indoor ski slope, is funding the research trip with a grant worth £85,000 as part of it’s ‘Snow Penguins’ programme, which aims to educate visitors about the species and the threats facing them in the wild. By Stephanie Winnard, Albatross Field Assistant at the BAS Research Station, Bird Island. September has seen big changes to the amount of wildlife on Bird Island, especially the avian species. It is now most definitely spring. From September 1st I was visiting the colonies on a daily basis eagerly awaiting the return of the first birds. After spending a few months seeing hardly any, I couldn’t wait to see the mollies back (collective term for the smaller albatrosses). The first bird, on September 13th, was a female first observed on the island as an adult in 1989, making her over 30 years old. So far she has raised three successful chicks out of 17 breeding attempts. Hopefully the 2014 season will see her fourth success. The grey-headed albatross have now returned in force and the colonies are noisy once again. They have been making renovations to their nests and are getting reacquainted with the partners that they haven’t seen for almost two years since they last bred. I have been visiting the main study colonies every day and recording which individuals are back. This is fairly easy to do, but very time consuming, as most of the birds have plastic darvic rings that can easily be read at a distance. 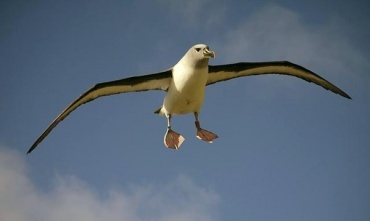 The black-browed albatross have also started returning, but in smaller numbers. The colonies still look quite empty, but it won’t be long before that all changes! Grey-headed albatross coming in to land. I am still busy ringing the Wandering albatross chicks, which are getting ever bigger, and starting to look more “adult” as they are losing their fluffy white down to reveal new dark sleek feathers underneath. I’ve ringed over 400 now, so there are only around 80 to go, which I will try to finish when we get some decent weather. The chicks can be seen flapping their wings on windy days, strengthening the muscles they will need to get off the island in a couple of months’ time. They have also begun leaving the nest mound and exploring their immediate surroundings. I don’t blame them as they must be getting bored sitting in the same place since they hatched in March! Jerry has started getting very busy with the giant petrels with the first egg arriving on the 13th, which was quickly followed by a further 159 during the rest of the month. Every day Jerry covers every square inch of the meadows checking each GP for an egg and recording the ring numbers of the adults. So far it is only the northern GPs that are laying eggs, but the southern GPs should follow in around a month. The number of Gentoo penguins has been steadily building all month but they don’t seem to be doing much nest building yet. Most evening’s decent sized groups can be seen jumping through the water towards the beach, before emerging all at once and waddling up to the nesting site for an overnight rest. Last year the first egg was laid on September 22nd, but this year it is unlikely to be until mid October. Gentoos emerging all at once and waddling…. Hannah is still doing the daily leopard seal round and also monitoring numbers of elephant seals seen on the beaches. The number of Leopard seal sightings this month has decreased, with only Max still being seen on a regular basis as the larger adults have started heading south for the breeding season. A Weddell seal was a rare sight hauled out on the beach having a sleep whilst we took lots of photos. A Weddell seal is a rare sight. Photos Stephanie Winnard. Recently we have started hearing strange noises at night, roaring belching sounds, which can only mean one thing. The male elephant seals have arrived! 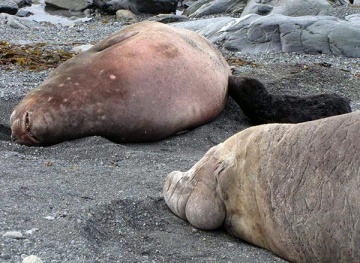 These huge creatures have started turning up on our beaches and lolling around in hope that some female elephant seals will join them on the beach. None of them seem to be having much luck yet, but it is nice to see these immense seals up close. We all have our fingers crossed that a few females will turn up and maybe have a pup. One was born last year on Landing Beach, just near the base, so we live in hope. Craig has been busy getting the base ready for the new season, painting all of the outside doors, and repairing the jetty that had been wrecked by one of our winter storms. Major Vivian Stevenson RM: Major Vivian Stevenson of the Royal Marines, who led the first attempted ascent of Mt Paget in 1960, has died. Major Stevenson died of leukaemia on September 22nd at the age of 78. Rex Hunt memorial unveiled: A memorial to the late Sir Rex Hunt – Governor of the Falkland Islands, and responsible for the then dependencies, which included South Georgia and the South Sandwich Islands, at the time of the 1982 invasions - was unveiled at a service of dedication in Zetland Park, Redcar (UK) on September 6th. The simple, moving ceremony was attended by his widow Lady Mavis Hunt on a wet and blustery day. During the service the Last Post and the national anthem were played, and there were prayers in honour of Sir Rex who died last November age 87. Sir Rex was born in Redcar and Josh Mason said he felt it was really important that those who had contributed to the rich local history and culture were remembered, and extended an open invitation to those with links to the Falklands to visit. 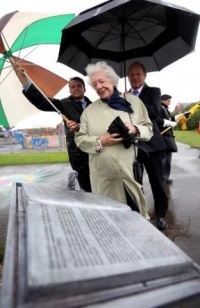 Lady Mavis at the unveiling of the memorial to her late husband Sir Rex Hunt. Photo The Northern Echo. Rat eradication radio diary: The Project Leader of the SGHT Habitat Restoration Project, Tony Martin, featured on the BBC Radio programme ‘Shared Earth’, broadcast on September 10th. 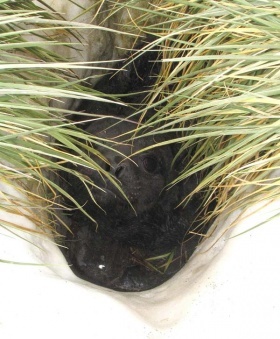 The question posed by the programme was that, seeing rats have caused havoc and destruction on many breeding bird populations, is it possible to remove them, and if it is, is it worth it? On the programme various experts discuss how rats reached remote islands around the world, how eradication attempts have fared, and how to choose where to attempt eradications in the future. During the broadcast, radio diary recordings made by Tony Martin in the field during the recent baiting of the northern-western end of South Georgia are played. The background noises of seals, birds and helicopters help bring the experience to life. In the early recording Tony Martin sounds energetic and optimistic, but by the time of the recording made on April 8th you can hear the strain in his voice as he begins to accept that prolonged bad weather may mean they can’t finish the job. Close to failing, and with fortunes switching daily, one might then have expected jubilation when they pull it off at the last moment, but instead, in his last report it seems what one really hears is sheer exhaustion. You can listen to the programme “Rat Eradication - Is It Worth It?” on the BBC iplayer. Just click here. Crafty success: Hand crafts made mainly as midwinter presents were once again entered into the Falkland Craft Fair. This is quite a logistical feat with the sometimes delicate craft work needing to be carefully packaged before being consigned as cargo on a ship which is met in Stanley by kind people who transport and look after the boxes for weeks until the craft fair, which is held over one weekend. After the show the arrangements are reversed to return everything safely to South Georgia. All that effort and care was well worth it again though as from thirteen entries, the crafts attracted twelve prizes or commendations: There were five 2nd prizes; two 3rd prizes; and four Highly Commended, but the only winner was a bit of a surprise. 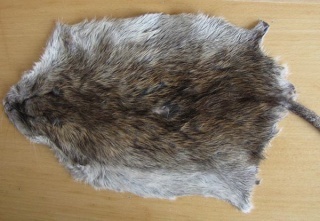 Entered as a bit of a joke, the cured rat skin by Jamie Doube got a 1st – but it was the only entry in the class! A cured rat skin got first prize while this beautiful keepsake box by Sue Gregory got a Highly Commended. Extended winter: September has been a month of big snowfalls with stormy weather lasting days on end and attendant blizzard conditions and persisting cold as southerly air streamed up from the Antarctic. Trapped on the Point by a big snowfall (and so avalanche risk on the track out) on the first weekend of the month, folks at KEP didn’t let the confinement get them down and set out to construct ‘Snow Sue’ who was a feature of ‘Webcam 1’ for a few days before she melted. The conspicuously female snowperson attracted many comments from webcam watchers who enjoyed the joke. Fun and games constructing ‘Snow Sue’. 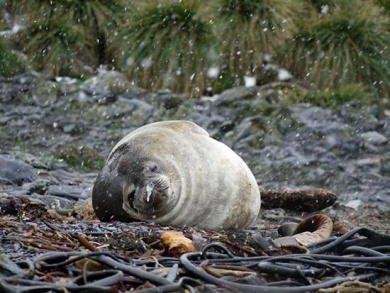 The persisting deep snow at sea-level, and steepened beaches from storm scour, is causing a few problems for the early elephant seals. The seals mainly prefer to pup on the stony or sandy beaches, but if forced up onto the snow the pups born there can melt through into large holes from which they cannot escape. One of the first pups born in the KE Cove area. Elephant seal pups that melt through the snow can end up in holes like this where they can’t be reached by their mothers.. The first pup in the KE Cove area was born at Horse Head on September 18th, and the first of the returning white-chin petrels were heard chirruping outside their snow blocked burrows the same night. The first pup born at King Edward Point was on the 28th. their beaches for the coming arrival of the females to breed.